Food News Journal featured this post in their Best of Blogs section on March 1, 2010! WOOHOOO!! There are times when I ponder existential questions.. the ones about what am I meant to do, where am I heading, What am I.. etc.. Over the course of self-soliloquizing I think I have answered one question - what excites me? I realise the thrill of learning something new and yes, mastering it ofcourse, is what drives me to do anything - from acads to work to blogging to cooking. The idea of "new and not yet discovered by me" holds a potent attraction for me! So, when I read on Trissa's blog about the Kulinarya Cooking Club that is all about showcasing Filipino cuisine, I eagerly messaged her about becoming a part of the club. Here was an opportunity to learn a new cuisine and, quite expectedly, I jumped all over it. 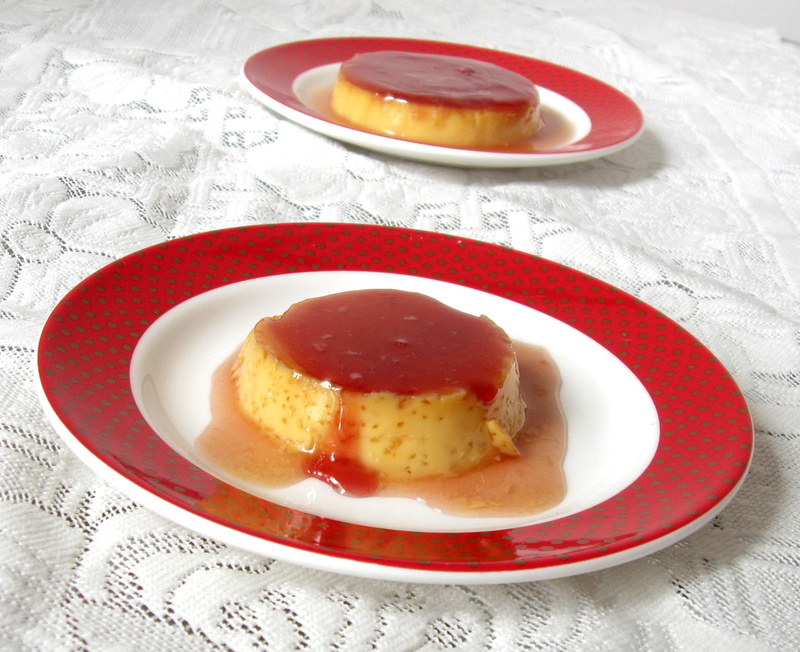 Today, I present to you, my first creation as part of this club - Blood Orange Leche Flan. I googled for the recipe and found that making it was soo simple. 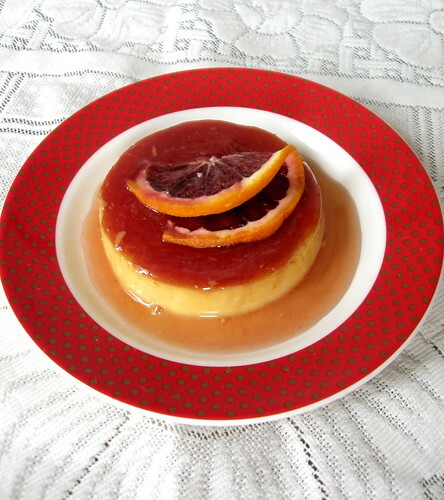 I chose to do a blood orange flan because citrus adds a touch of freshness to desserts. This recipe calls for quite an amount of sugar in the caramel as well as the condensed milk. I have a sweet tooth but do not like very sweet stuff. I find that the citrus cuts into the intense sweetness. The traditional Filipino way of cooking the flan is by steaming it. 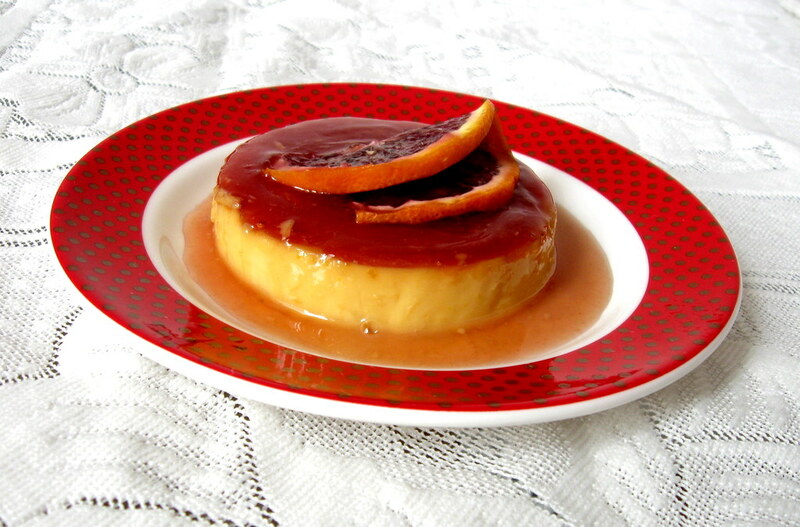 You can also bake it in a water bath much like Spanish flans are. I decided to try both methods, just for the sake of experimenting. You can see in the photo that there are some textural differences in the end result between the two methods of cooking. The one in the foreground is steamed.. Verdict: The flan was creamy and smooth but a tad too rich for my taste. We preferred the steamed flan more than the baked one as the latter the denser and heavier while the steamed one was more airy. Note to self: Next time I won't cook the caramel for as long as I did. Removing the flan was a bit of an issue because I had cooked the caramel to the hard ball stage, so it offered a loot of resistance exiting the mold! But, all good! :) Also, will reduce the amount of condensed milk. This one was too sweet and heavy. In a small sauce pan bring the sugar and juice to a boil and heat until sugar caramelizes. I did this till the thermometer read 250F, which, was too long. I think before 230F (thread phase) would be better. If you are using only water then the color change is a better indicator. Immediately pour the caramel into the molds and set aside. Using a wire whisk gently break the egg yolks and whisk them lightly with the zest. Add the evaporated milk and gently stir to incorporate. Stir in the condensed milk and juice. Divide the flan mix equally between the molds. Baking: Pre-heat the oven to 375F. Cover each mold with foil. Place molds in a hot water bath and bake for 30-35 minutes until just done. Cool on rack to room temperature and then refrigerate. When ready to serve, place the molds in a hot water bath to melt the caramel. Place a plate over the mold and invert. Spoon any remaining caramel over the top of the flan. Serve garnished with a slice of orange or sprig of mint.